I know I'm a little bit late for Thanksgiving... Canadian or American... but I think there's never a bad time to thank you again for all your support. Thank you for reading, for spreading the word, for buying my swag and for coming out to see me at shows. Drawing comics was always my hobby, but it's only because of you that it gets to be my job. And it's the best job ever! Next week: more comics! See you on Monday! Anyone looking to refresh their memory about Sid's time on the "Island of Lies" with his fellow supposedly-dead musicians need only turn back to these two short storylines: Return of the King, and Living in Sin. Friends, as hard as it is to believe, our three-years-in-the-making epic is coming to a close. Tune in Friday for the final comic of Volume 4! 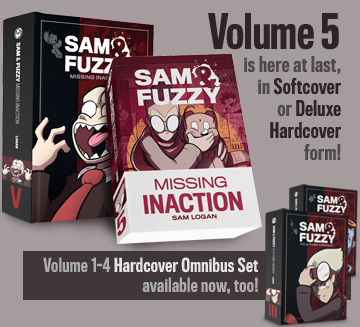 After that, I'm going to take a quick breather for a couple of weeks before launching into the next chapter of the Sam and Fuzzy saga proper. But don't fret! 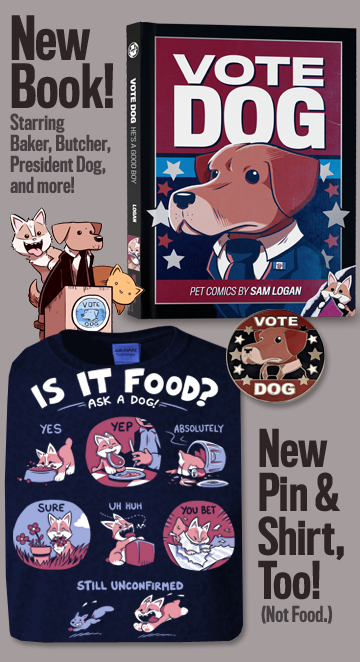 I will have plenty of other comics for you to read in the meantime. Some of them might even be good! Friday is also, incidentally, the final day of our latest custom t-shirt 3-pack offer. If you would like to save an extra $7 when you order a trio of our shirts, you still have a couple of days to do so!